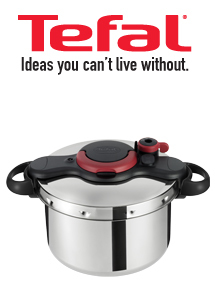 Introducing the Tefal Clipso Minut Easy pressure cooker. The P4620768 can be used on all styles of hobs including induction hobs. Features include; 18/10 stainless steel body and lid, dishwasher safe body, silicone gasket and steaming basket. With a 6L capacity and can serve up to 6 people, the Clipso Minut is the perfect addition to your kitchen.